The tour started with a training session at Bledlow CC where Manoj put the boys through their paces. The seven new players, Antar, Aryan, Eden, Ethan, Jimmy, Nathaniel, Nikhil, were presented with their Swiss caps by Manoj. The practice included a net session and one to one coaching on the bowling machine. This was preparation for the first match of the tour that evening against Horspath CC U13s. Horspath won the toss and chose to field. The Swiss innings got off to a difficult start as the boys struggled to adapt to an early season grass wicket which was keeping very low. Openers Amogh and Eden both went cheaply which brought Ismail and Captain James West to the wicket. Against some accurate bowling they steered the total past 100 with Ismail retiring for an outstanding 51* off 53 balls including 8 fours and one 6. Luke scored a quickfire 16 before falling LBW to A Turner. More wickets fell cheaply and James was out for 45 in the final over with the total reaching 171 for 8. In reply, Ismail and Eden opened the bowling conceding only 4 runs in the first three overs. Aryan and Amogh continued the pressure, with Aryan picking up two wickets and Amogh bowling a remarkable spell of 4 overs for just 1 run. At the halfway point the game looked over with a score of 50 for 2 off 15 overs. The local knowledge started to pay off however and the run rate accelerated with C Turner (40) and J Richardson (26) scoring freely. The Swiss team stuck to it with some outstanding fielding, notably from Max and Nathaniel, and wickets fell at critical time. The final wicket fell with the last ball of the innings and the tourists won by 16 runs. Following the match Horspath CC showed great hospitality proving dinner for all players and supporters. J Richardson won the player of the day trophy and James W received a MP Sports cricket ball for his innings of 45. 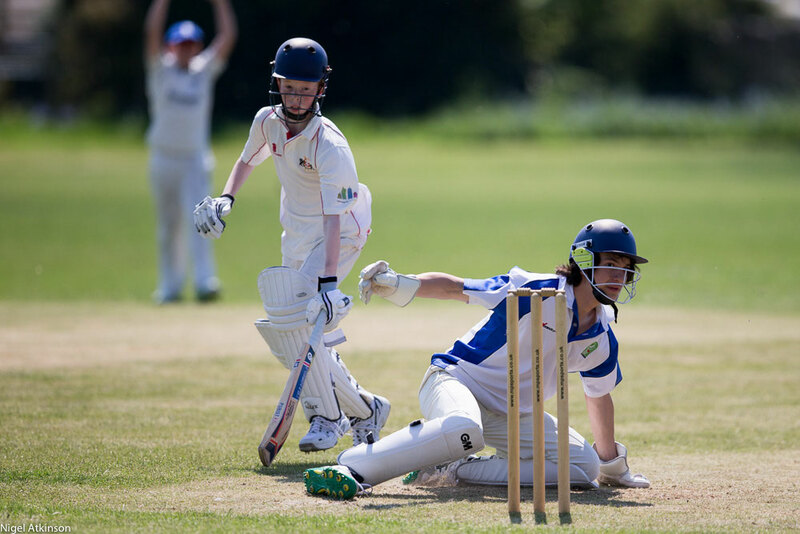 The second day of the tour moved to Long Crendon CC and back to back matches with a young MP Academy team. Match 1 was 25 overs a side in glorious sunshine. The tourists batted first and despite losing Nathaniel in the second over, Antar (21) and Max (32*) batted very sensibly taking the score to 50 after 10 overs. A flurry of wickets followed taking the score to 65 for 5. Recovery came from Luke with a quickfire 30 and James W with 23 who pushed the run rate and steered the score to a respectable 154 at the end of the innings. A fiery opening spell from Ismail and Eden had MP Academy pegged to 10 for 1 after 5 overs. Aryan, 2 overs for 3 runs and Amogh, 2 for 11 in 3 overs, both bowled accurately to keep the pressure on and there was no relief as Max bowled consecutive maidens.The Swiss U13 continued their excellence fielding performance with keeper Luke taking a difficult stumping chance and great teamwork preventing many runs in the field. Antar picked up two more wickets as the innings closed on 60. In order to even things up, the rules were adjusted for the second match so that the Academy side would not be penalised for bolwingwides and no balls; the onus was on the Swiss team to score their runs off the bat. Batting first again Eden and Ethan made a great start putting on 48 before Ethan was out for 29 in over 6. Amogh with some solid hitting and then Ismail kept the run rate up and along with Eden all retired as they passed 30. 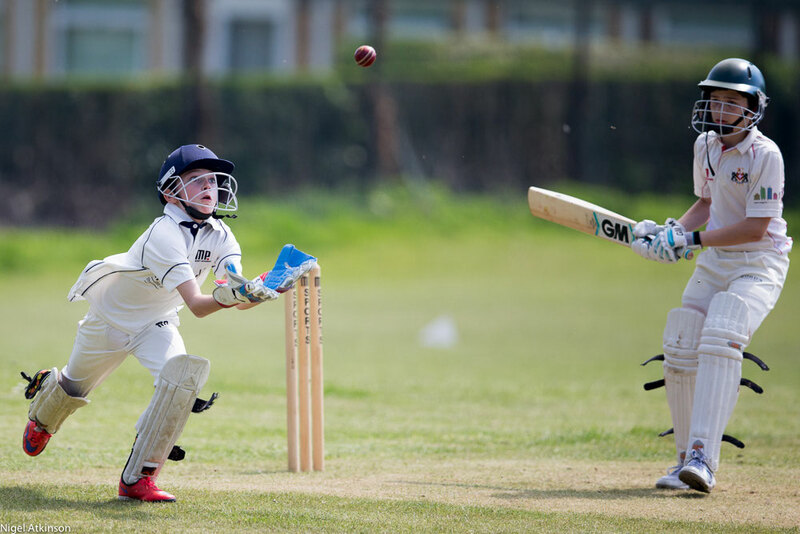 Luke came in to face the last ball and hit a magnificent straight 6 to take the score to 135 off 15 overs reflected how well the team were adjusting to the conditions. The reply followed the pattern of the first match with frugal bowling and sharp field making runs hard to come by. Amogh was again pick of the bowlers taking 2 for 5 in 2 overs. The innings closed on 61 after 15 overs. The day concluded with Luke being nominated player of the day and both teams then went to the local swimming pool for some water based cricket drills. The final game of the tour was with mixed teams between the Swiss U13s and MP Academy. The format was an unusual one for Swiss cricket in that it was a time game with no restriction on overs. Ismail and James W were captains, Ismail winning the toss and choosing to bat. Amogh and Zeki, guest player from the U15s, got off to flying start reaching 50 in over 6 and when they both retired Ismail, Nathaniel, Max and then Aryan continued the rapid scoring. One hundred was reached in over 9 and 150 in over 17 as the ball flew to all corners of the ground. The only tricky thing for Ismail was to decide when to declare. After lots of helpful advice, Ismail finally declared at lunch when the score reached 187 off 21 overs. This seemed like a fair declaration as it left 2 hrs 15 minutes or around 35 overs for James team to score the runs. Eden and Ethan started well taking the score to 26 in over 4 when Amogh’s nagging accuracy was too much for Eden who fell LBW. Ethan quickly followed LBW to Max and then Luke was undone by Ismail’s slow ball which clean bowled him. At 34 for 3 it was time to rebuild and James W and Harsh knuckled down. 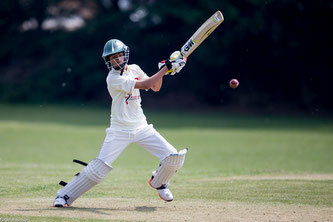 They took the score to 70 in over 14 when Nathaniel trapped Harsh LBW for 14. Jimmy followed very quickly bowled by Charlie and then James retired on 21. Harry batted very sensibly with a lot of close catching fielders but wickets kept tumbling at the other end. When Antar was caught by Amogh off Max with the score on 103, James re-joined Harry as the last pair needing to bat out 55 minutes for a draw and Ismail’s team needed just one wicket. Despite accurate bowling and many close catchers, the batsmen were hanging on. Finally Max’s persistent accuracy got him his third wicket as he took James caught and bowled. The day and the tour was rounded off with Amogh nominated player of the day and all the 12 Swiss players receiving a trophy as a memento of the tour. We thank Manoj Parmer for all his efforts to make the tour successful, the players’ parents for their commitment to allow the team to tour and Cricket Switzerland for their support. 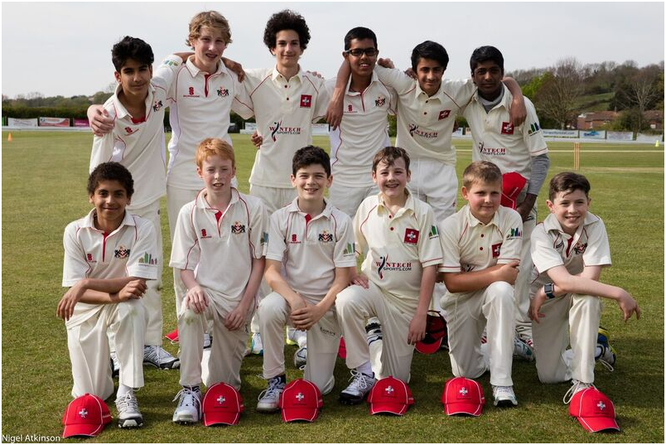 For further information on the Swiss U13 Tour to England from 5th - 8th May 2016, contact Steve West. 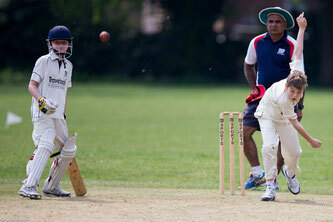 Go to the gallery to view more photos of the Swiss U13 tour to England.